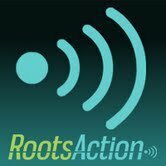 RootsAction is an online initiative dedicated to galvanizing people who are committed to economic fairness, equal rights for all, civil liberties, environmental protection -- and defunding endless wars. We will not be silent as President Trump and Congress continue to squander billions of dollars on foreign wars, causing destruction and hatred overseas while failing to meet the needs of the vast majority of people in our country. We will not stand by as people lose their jobs, homes, healthcare and income due to corporatist policies abetted by both major parties. We will take action -- independent of both party leaderships. That’s why RootsAction has been strongly endorsed by such respected, independent-minded progressives as Jim Hightower, Barbara Ehrenreich, Cornel West, Daniel Ellsberg, Glenn Greenwald, Naomi Klein, Bill Fletcher Jr., Laura Flanders, former U.S. Senator James Abourezk, Frances Fox Piven, Lila Garrett, Phil Donahue, Sonali Kolhatkar, and many others.